Alessandro Pampurino (ca.1460/62-ca.1522/23) was probably born in Cremona where he spent all his life. Very little is known about his life whereas his works documented in a very few local sources. He was mostly active as a fresco painter. This ceiling grisaille was originally depicted on a vault in Casa Maffi, Cremona. It represents the Muses, female allegorical figures embodying divine inspiration in art, with Apollo, god of Music and Poetry. In the lunettes below, arranged by pair, are represented profiles heads of the Roman emperors and their respective wives. In the centre, an old man, a woman and a boy looking down are set against a deep blue sky. This fresco is a fine example of Renaissance domestic decorative schemes that came into fashion in Northern Italy at the beginning of the 16th century. Often based on Greek and Roman mythology, these decorations allude to intellectual and political virtues sought after by the humanists of that time. Ceiling. Dome shaped with concave recesses at the four corners, and painted decoration in distemper in colours and grisaille. In the centre of the top is represented an oculus from which an old man, a boy and a woman look down, listening to the Muses, eight of whom are depicted in medallions, while Calliope and Apollo occupy lunettes facing one another. Eight smaller lunettes are filled in with classic heads of Roman emperors and their wives. 428-1889 was originally located in a room on the ground floor of a building that belonged to the Augustinian nunnery of the Colomba in Cremona. The building was situated in Via Belvedere 6 (near the Church of St Peter) and was later named Casa Maffi. The fresco was still in situ in 1884, when it was mentioned in G. Frizzoni’s commentary of Anonimo Morelliano (Notizie d’opere di disegno, 1884, p. 93). 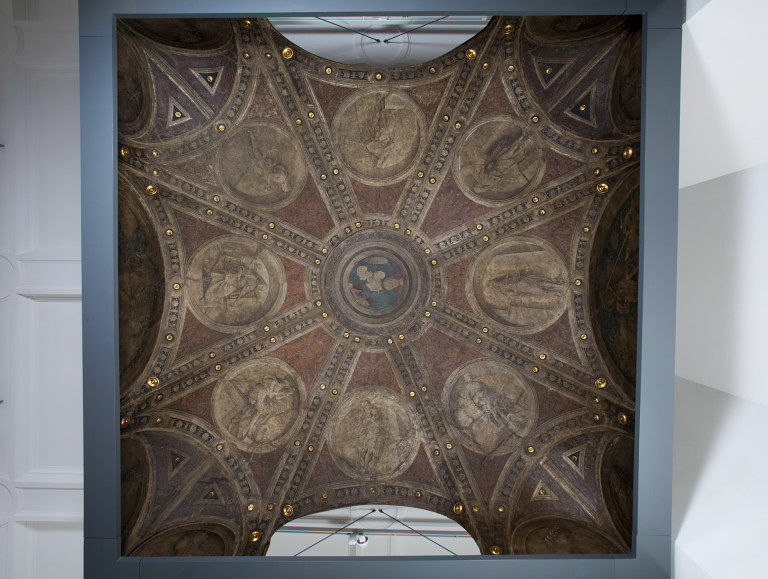 The museum acquired the ceiling in 1889 for £ 1000, from the Italian dealer Stefano Bardini. W. Spence, a British dealer, facilitated the negotiations between Bardini and the South Kensington Museum (see the Registry file, and also Fleming, 1979, pp. 572, 578). A document in the Registry file states that Bardini bought the ceiling from Captain Robelatti, who was at the time the owner of the house. 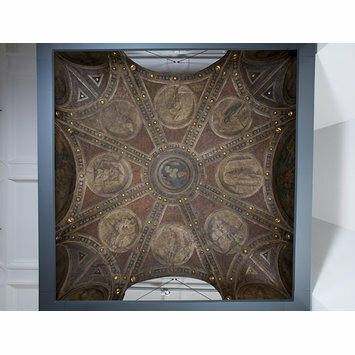 When the ceiling was mounted at the V&A, the central section was assembled incorrectly, being mistakenly rotated by 150° from its intended position. A drawing by G.B. Cavalcaselle (now in the Biblioteca Marciana, Venice; see Fabianski p.191) shows how the ceiling was originally positioned. Historical significance: This ceiling grisaille was originally depicted in casa Maffi, 5 via Belvedere, Cremona and was still in situ in 1884. It was removed between that time and 1889 when it was sold to the Museum. It is decorated with figures of Apollo and the nine Muses, and profiles of Classical emperors and their respective wives in the lunettes below. The central oculus, with a plant in a pot, heads of a boy, a woman and an old man set against a deep blue sky with a cloud, derived from that in the Camera degli Sposi at Mantua completed by Mantegna in 1478. The four spandrels, i.e. the three triangular sections that originally occupied the four corners of the ceiling, of which only 3 are documented in Stefano Bardini's photographic archives, never reached the museum and appear disposed (Fahy, 2000). Each muse is identified thanks to her attribute (from top anticlockwise): Terpsichore with a viol, Erato with a tambourine, Thalia with a viol, Melpomene with a horn, Euterpe with a double flute, Clio with a swan, Polymnia with an organ and Urania gazing at a sphere. On each side, depicted in a larger lunette are Calliope with a trumpet (right) and Apollo (left). The figures of Apollo and Calliope, as well as the Muses, derive from the so-called Tarots of Mantegna (see Bologna 1954 p. 167; Fabianski 1988, pp.196 ff.) Fabianski states that the specific sequence in which the Muses are displayed is derived from Fulgentius' Fable on the Nine Muses in which they come to represent science and learning, concepts that they embodied throughout the Middle Ages and the Renaissance. It was believed that by playing their musical instruments the Muses were transmitting the light of the divine inspiration, from the celestial spheres to the earthly world, hence their representation with discs. The Muses came to represent the celestial spheres, with Apollo as their leader. This is the reason why the ceiling is octagonal: it corresponds to the eight spheres. The emperors and their wives have been tentatively identified as: Scribonia, Galba? (or Titus? ), Trajan ?, Augustus, Nero, Agrippina?, Lucius Verus, Galba? (or Titus?). These profiles portraits imitate bas-relief and are probably based on ancient coins. The ceiling is compartmentalised and decorated in all'antica fashion with different types of grotesques and friezes. Each section is bordered with a decoration of palmettes or grotesques representing busts of women, bulls and Pegasus with twining acanthus, candelabra, amorini and cornucopia. Although the direct models for this decoration have not been found, it seems plausible that they might derive from prints. Zeri (1978, p.319) pointed out for the first time that the quality of the oculus is inferior compared to other sections of the ceiling, and in his view this suggests that it might have been painted by a different artist. Curiously, the same discrepancy has been pointed out for Mantegna's oculus (Agosti 2006, p. 38): on the Mantuan ceiling three heads of girls have been repainted, probably by Mantegna's son Francesco around 1506. A restoration could possibly explain the discrepancies of the Cremonese oculus. The attribution had long been subject to debate. Grasselli (1827, p.42), who also mentioned a "Nativity" painted on one of the walls of the room, attributed the ceiling to Bonifacio or Gianfrancesco Bembo. Sacchi (1872, pp. 35, 136), who saw the Nativity in the Bignami collection at Casalmaggiore, wrote that the Nativity had been detached by Galizioli, a restorer from Brescia. Crowe-Cavalcaselle (1912, vol. III, pp. 332-333) attributed the ceiling to a Cremonese painter, possibly Boccaccio Boccaccino or Altobello Melone, and already emphasized the influence of Mantegna's Camera degli Sposi (Ducal Palace, Mantua) on the fresco. Frizzoni (1884, p.93) linked the ceiling with one mentioned by Marcantonio Michiel (also known as the 'Anonimo Morelliano'), ca. 1530, in the house of the "prior of St Anthony": "a round chamber with the vault that represents our celestial hemisphere was adorned and divided by [sic]". The name of the artist is missing from the original manuscript. ("El Camerin rotondo con la volta che rappresenta el nostro emisfero celeste, fu ornato e camparito da...".) This association has been rejected by many scholars, recently by Tanzi (1984) and M.Gregori (1985, p.242) whereas F. Bologna (1954, pp. 166-171) attributed the fresco to the late activity of Antonio della Corna, which was retained by C.M. Kauffmann (1973, pp. 9-11). M. Gregori (1985, pp. 27, 42-8), attributed 428-1889 to Alessandro Pampurino, an attribution that was apparently confirmed thanks to Stefano Bardini's photographs of the missing clearly inscribed with OPUS/ALEXANDER/PAMPVRI... (n. 18 Grottesque with two women, a Triton and a tondo with an old man on a chariot led by a young boy.) Furthermore, Crowe-Cavalcaselle (1912, p.333) published a previously unknown drawing of the room, which proves that the room was in fact square, and thanks to which Fabianski demonstrated that the ceiling was erroneously mounted at the V&A, with the central section rotated by 150°. However although the attribution to Pampurino is convincing, the reconstruction offered by Fahy is not. Firstly, the drawing by Calvalcaselle does not show any extra spandrels besides those that can already be found in 428-1889. Secondly, the quality of these three spandrels -judging by the photographs in Bardini's archive- is crisper. Thirdly, these three photographs have handwritten annotations that the photographs of 428-1889, in the same file, do not. This might prove that they belonged to a different group. Despite these conjectures, the style of the two groups of frescoes is very similar; the same grotesque motifs can be found in both. Therefore, the attribution to Pampurino, whose signature appears on one of the three spandrels, is acceptable. The three fragments might have decorated another room of the same house, perhaps adjacent: this might explain why they never came to the V&A. Very little is known about Alessandro Pampurino. Documents published in 1985 register his commission for the painting of two organ shutters in the church of San Michele in Cremona, to which the V&A fresco has been often associated. Excepting the spandrels referred to above, only the frescoes in the church of Scandolara Ravara bear his signature. Little is known about where he trained, but it is certain he started out as a manuscript illuminator showing Ferrarese, Emilian and Venetian influences (see M.Gregori, 1990, pp.19-22, 242 for more details of his activity). The exact function of the room is still subject to debate. Fabianski's suggestion that it could have been a studiolo-musaeum seems probable (p. 209), a sort of hall "all'antica" in which, following the humanist mode, people would meet and converse about books and possibly admire antique works of art. The room had a marked impact on the artistic community of Cremona: indeed, a few years later, a room near the cloister of the church of Sant'Abbondio in Cremona was decorated in a similar way, with the ceiling and the upper walls clearly recalling Pampurino's model (see M. Leino and Ch. Burnett, 2003). Although this ceiling, which is dated 1513, does not have an umbrella-like vault, the compartmentalization of the decoration with heads of emperors in roundels, lunettes with philosophers replacing the Muses, and grotesques around the main scenes, is clearly derived from 428-1889. Furthermore, there is also an oculus at the centre of the ceiling although the illusionism is here lost. A veiled, half-length allegorical figure of Sapientia (Wisdom) is represented as if it was a quadro riportato. The same solution with pairs of small lunettes at the corners of the room is adopted in this fresco, as well as in 428-1889. 428-1889 is one of the most important profane cycle painted around 1500, prior to Correggio's Saint Paul Room which was commissioned by the abbess Giovanna of Piacenza, and is one of the earliest to show the great impact that Mantegna's Camera degli Sposi had on the artistic community and humanist culture of Northern Italy. 428-1889 may have also been commissioned by a woman. Around 1497, two convents were reunited under the Belvedere nunnery of Cremona: the Augustinian nunnery of Santa Monica, directed by the abbess Francesca Bianca Sforza -Ludovico il Moro's sister - and under the protection of Bianca Maria Visconti, and the Cistercian nunnery of the Colomba (see Gregori, 1990, p.242). It is therefore plausible that the patron of the fresco might have been a woman from one of the prominent Milanese families, who used the room for meditation and learned conversations. Fresco painting is among the most complex projects undertaken during the Renaissance. This technique, i.e. painting on wet plaster, originated in the Antiquity (see the surviving fresco of Pompeii, near Naples, destructed during the eruption of the Vesuvius in 79 B.C. ), was reintroduced and developed in the late 13th century and the 14th century particularly in the work of the Isaac master, Giotto and his followers and perfected during the Italian Renaissance, culminating in Michelangelo's technological tour de force in the Sistine chapel, Rome (1508-12). This medium was used to decorate large wall areas of both private and public buildings. Such sizable paintings, in which timing was of critical importance, took careful planning and involved a number of assistants. A precise plan in the form of a drawing or of many drawings was required so that the composition would fit exactly on the wall. The artist could draw directly on the wet plaster (this underdrawing technique is called sinopia) or use cartoons (from the Italian word cartone) from which the composition was then transferred onto the wall. Another method of transfer, used especially in the 17th century for vast ceiling frescoes, was squaring, which replaced the time-consuming and costly cartoon technique. Marcin Fabianski, 'The Cremonese Ceiling examined in its original studiolo setting', Artibus et Historiae, n.17 (IX), 1988, p.189-212. F. Bologna, 'The Cremonese Ceiling from Via Belvedere', The Burlington Magazine, 1954, pp. 166-71. Malaguzzi-Valeri, La corte di Ludovico il Moro, Milan, 1913, p. 98. Anonimo Morelliano, Notizie d'opere di disegno, ed. by G. Frizzoni, Bologna 1884. G. Agosti, Su Mantegna I. La storia dell’arte libera la testa, Milan, 2006, pp. 385-386, 423. J. Fleming, 'Art Dealing in the Risorgimento III', The Burlington Magazine, vol. 121, no. 918, 1979, p.572 note 38, p. 578. J.A. Crowe and G.B. Cavalcaselle, A history of painting in north Italy, Venice, Padua, Vicenza, Verona, Ferrara, Milan, Friuli, Brescia from the fourteenth to the sixteenth century, 3 vols., ed. by Tancred Borenius, London 1912. F. Sacchi, Notizie pittoriche cremonesi, Cremona, 1872. M.Tanzi, 'Per gli esordi cremonesi dello Pseudo-Bramantino, in Bollettino d'Arte, LXIX, 26, pp. 13-30. F.Zeri,' Book review of Kauffmann's 'Catalogue of Foreign Paintings'', Antologia di Belle Arti, 1978, 7-8, pp. 317-321. M.Gregori ed., I Campi e la cultura artistica cremonese, Milan, 1985, pp.42-45. This ceiling comes from the house of a prior in Cremona. The surprisingly grand decoration was based on a ceiling painted by Mantegna in the Palazzo Ducale in nearby Mantua. It includes Apollo and the Muses (the goddesses who represented the arts and sciences) and a trompe-l'oeil painting of a man and boy looking down through a central aperture.